For Piano. 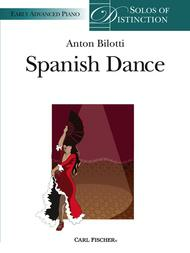 Composed by Anton Bilotti. Edited by Elizabeth Gutierrez. Solo part. With Standard notation. Opus 1. 8 pages. Carl Fischer #P001459. Published by Carl Fischer (CF.P1459). ISBN 082582284X. Key: F minor. These rewarding and motivating piano solos represent the best of Carl Fischer's extensive educational piano catalog in newly engraved versions. Painstakingly edited by Carl Fischer Piano Editor Elizabeth Gutierrez, this series is comprised of a wide array of classic gems selected for their superior pedagogy and distinctive musical styles. These editions contain stunning new artwork and level-appropriate engraving sizes. Students and teachers will especially enjoy the attention given to grade-appropriate size of engraving. Grade levels are color-coded and range from early elementary to late intermediate. 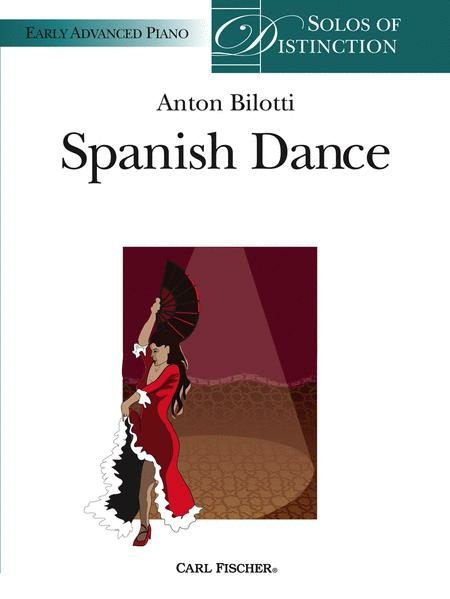 Spanish Dance is a gratifying solo to learn and perform and just as exciting for listeners. Awesome composition, my student is really enjoying this music piece!I highly recommend for late intermediates.